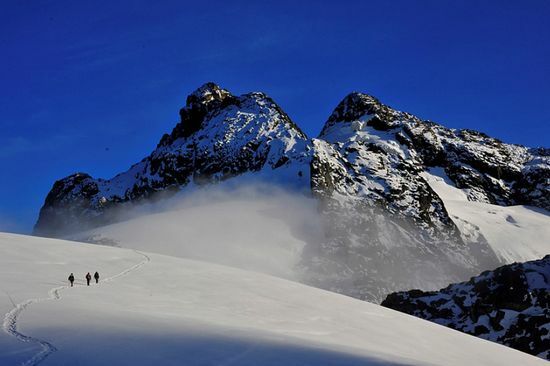 Please Crew Treks team in the Rwenzori mountain range in Uganda and the ascent of Margherita Peak 16,761ft, the third highest mountain in Africa. The scenery is so brethtaking, summiting is just an icing on the cake. 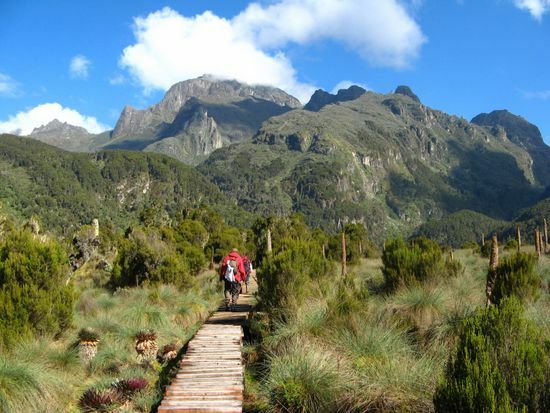 Therefore, those interested in just hiking should seriously consider joining this trek. In fact, in the eyes of Asia Sznajderska (Africa head guide) and Marek Wencel (owner of Crew Treks Adventures) this is now primary hiking/trekking destination-remote, seldom visited and full of incredible scenery. Over the course of eight days, you cross countless boardwalks, bridges, streams, wood ladders and muddy swamps. All along basking in ever changing landscape-its like someone would dropp you off in the middle of movie set of Narnia or Lord of The Rings. Day 1-Jan 03 2020 Arrival at Entebbe airport, meet and greet and transfer to hotel in Entebbe . Overnight at hotel. Day 3-Jan 05 2020 After breakfast you are transferred to Nyakalengija to start your hike. Here you meet the mountain guides and porters, we will also stop for picnic/packed lunch. We will trek for 3 - 4 hours through coffee plantations and crossing the Mahoma River travelling through forest for overnight at the Nyabitaba Hut (2650mt) set on a forested ridge with a view of portal peaks and Bujuku Valley . Day 4-Jan 06 2020 Early breakfast, then we’ll start the hike to John Matte Hut (3550mt), a 6 - 7 hour walk. 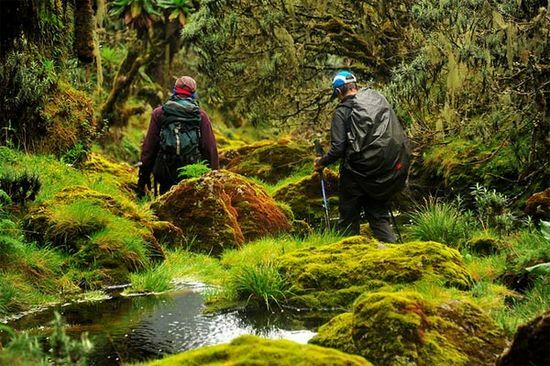 Our trail descends through forest to cross to Bujuku River at Kurt Shaffer Bridge and through a Lobelia, Giant Heath and Grounsel forest we will stop at Nyamileju hut "Place of Beards", name that refers to the moss and lichen hanging from the trees. We will carry on to John Matte,Hut which is close to the river in a grove of Giant Heather, for overnight. Day 5-Jan 07 2020 Trek to Bujuku Hut. (3977mt), a 6 – 7 hour walk. We will travel through the two Bigo Bogs to Bigo Hut, crossing Kibatisi Bog to cooking pot cave and on to the beautiful set of Lake Bujuku . Here you should be able to have a wonderful view of Mounts Stanley, Speke and Baker and the incredible ice cave on Mount Speke should be clearly visible. Day 6 Jan 08 2020 Trek to Elena Hut (4541mt), a 4-hour walk. We will leave the valley early through beautiful vegetation consisting of Giant Groundsels and Lobelia and the views of Savoia and Elena Glaciers. Further ascent via Scott Eliot Pass (highest point of loop trail 4372mt) through the snow to Elena Hut for overnight. Day 7-Jan 09 2020 For those climbing, this day marks a final ascent to the third highest mountain in Africa , Margherita Peak (16,761ft). The ascent takes about 4 -5 hours. After summit we descend for about 4 – 5 hours to the beautiful Lake Kitandara for overnight at Kitandara Hut (3900mt) Trekkers will leisurely descent to Kitandta Hut and explore beautifull landscape around. Day 8-Jan 10 2020 We trek to Guy Yeoman Hut (3480mt), a 6-hour walk. We will make a steep ascent to the fresh field pass (4282mt) and then descend to Bujonglo Cave (3720mt) the base used for Duke of Abruzzi's 1906 expedition. We will pass the Kabamba Cave (3450mt) the waterfall and rock shelter. Overnight at Guy Yeoman Hut set in Giant Heather zone. Day 9-Jan 11 2020 Descend from Guy Yeoman to Nyabytaba Hut, a 6-hour walk. Steep descent through the Bamboo Zone via Lake Mahoma . Overnight at Nyabitaba Hut. Day 10-Jan 12 2020 We descend for about 2 - 3 hours to Nyakalengija Ibanda where the trek ends. Our vehicle will be waiting for you to be transferred to Kasese. Day 11-Jan 13 2020 Breakfast, and departure to Entebbe. Along the way, we will make frequent stops to explore local cuisine and culture. All bottled drinks on the trail, example: beer, soda, bottled water, etc. Variety of nuts, power bars, dried fruit, energy gels, crackers, GU jells, powder drinks for mixing-Gatorade. Required Medications: Antibiotics-Cipro-for food poisoning/lower body infections, Amoxicillin-for upper body/respiratory infections, Aspirin-helps in acclimatization, Diamox-helps in acclimatization.